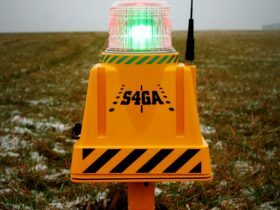 Our solar airfield ground lighting system (S-AGL) is designed an as alternative for conventional (wired/MAINS) systems. Our customers normally operate in remote locations such as African Desert, Jungles of Brazil or Alaska where conventional airport lighting system is not an option due to unavailable or unreliable electrical infrastructure or when our customer is looking for cost effective solution. 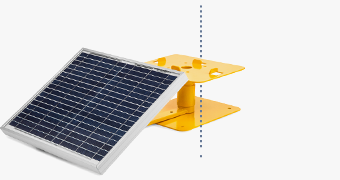 Solar Airfield Ground Lighting System (S-AGL) is used today as primary, emergency and temporary system by both airports and helipads all over the World. Historically battery-powered systems have been utilized as an emergency airfield lighting system. 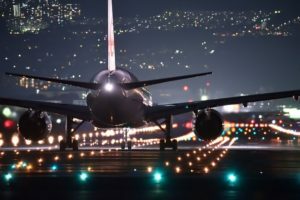 However with development of solar energy, power saving LED-based lights and deep-cycle batteries those systems are now used as primary runway lighting by many airports. Many features of AGL Solar makes its significantly more reliable and maintenance-friendly than conventional AGL system. 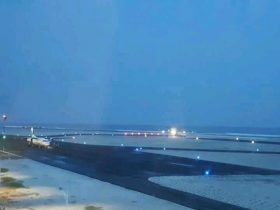 Conventional airfield ground lighting (AGL system) is energized by electrical circuit that includes multiple elements such as: lighting fittings, constant current regulators, isolating transformers, primary cable, secondary cable, joints, etc. Yes – conventional lighting today is built of reliable components. But as with every reliable components – failure one component may lead to failure of entire or part of the lighting system. In case of Solar AGL System is built of separate units. If two or more units are off – the rest of the system will continue to operate. Conventional airport lighting system is controlled by changing current flowing via cable. If there is no electricity in the circuit Or circuit lost its capacity to transmit current – there is no way to control lights. 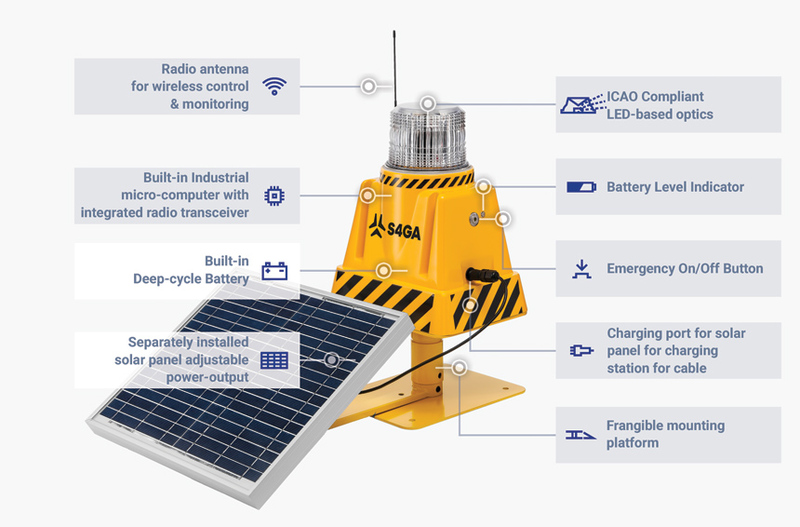 S4GA solar airfield ground lighting system (S-AGL) is controlled wirelessly (via encrypted radio-network). It means that power and control of the system are two separate systems. If one or even few lights are off – you can still control the rest of the system as there is no connection between power and control. Conventional airport lighting is energized by complex electrical circuit which requires highly qualified electrical engineers to design, install and maintain. Find out why else Solar Lighting is more reliable and use friendly than conventional systems. Guide of airport lighting color diagram. 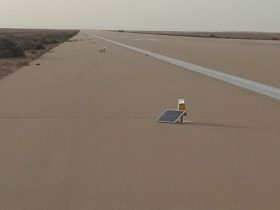 An airport in the desert, jungle or on a glacier; also, any other airport where electricity access is hindered or impossible; apart from that, airports the management of which does not have substantial financial resources at their disposal – in all of these cases, solar airport lighting can be used (S-AGL > Solar airfield ground lighting). 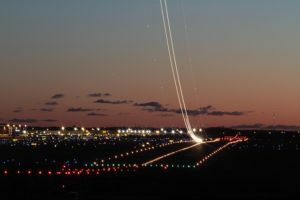 It emerged as an alternative to conventional airport lighting (AGL > Airfield Ground Lighting) and is more and more popular not only at remote airports but also the most advanced ones. Today, we will take a closer look at what Solar Airport Lighting has to offer. 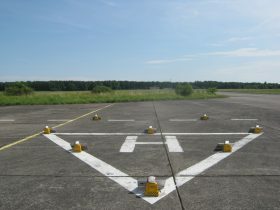 Airfield lighting consists of lights that are used to illuminate facilities located at an airport and navigate a pilot. 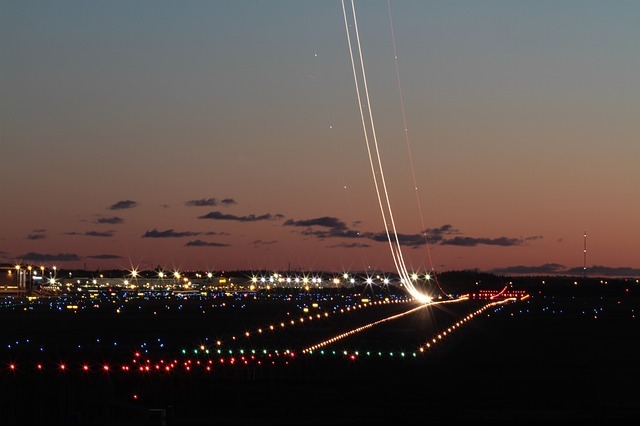 Airport lighting systems include, among others, runway lighting (edge and end lights) and taxiway lighting. 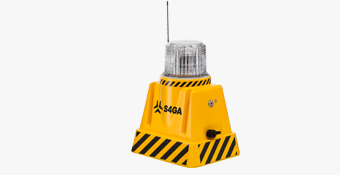 Airfield Ground lighting (AGL) also consists of systems that indicate the approach path; the most popular is the PAPI system. 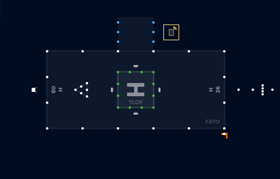 Moreover, wind direction indicator and apron lighting are also considered parts of AGL. All of these systems are to be found in a solar-powered version. Additionally, solar airports lights are as reliable as electricity-powered lights. 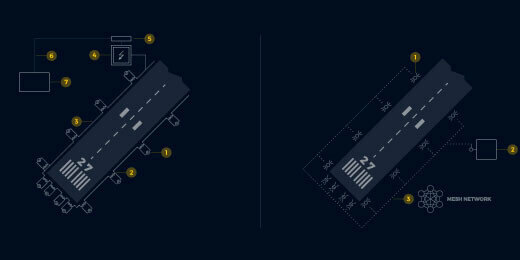 A runway is the most important element of an airport. Thus, many types of lights of different colors are used to illuminate a runway. 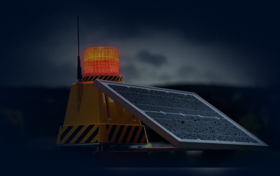 Solar runway edge lights give out a white light of changeable intensity levels: high (HIRL – high-intensity runway lights), medium (MIRL – medium-intensity runway lights) and low (LIRL – low-intensity runway lights). Runway edge lights are placed all along the runway edges, symmetrically to the centerline. 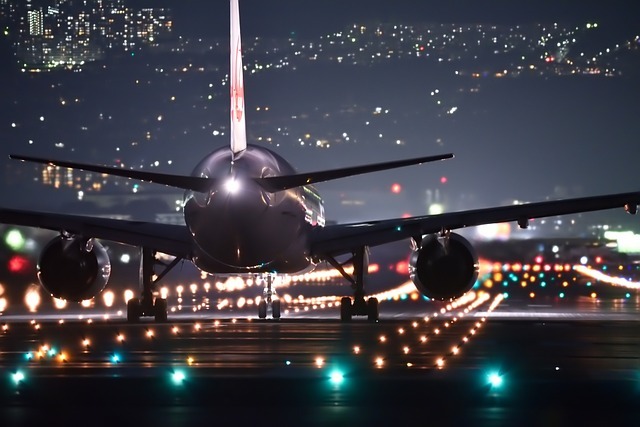 Moreover, there are also runway threshold lights (green, uni-directional lights or red-green, bi-directional lights) and runway end lights (red, uni-directional). PAPI (precision approach path indicator) informs a pilot about their location in relation to the approach path. It consists of two sets of lights, four units per set, and they are located on both sides of a runway. They are calibrated so that a pilot sees the right light color which depends on the location in relation to the approach path. A pilot receives clues: “too high”, “a bit too high”, “in the approach path”, “a bit too low” and “too low”. Wind direction indicator is one of the airport elements that need to be illuminated if a given airport operates at night. The indicator gives information not only about wind direction but also about its speed. 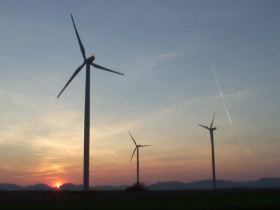 The characteristic sleeve starts to move as soon as the wind speed reaches 6 km/h. If the speed exceeds 28km/h, the sleeve fills in with air and takes a shape of a long cone. At the peak of the wind indicator’s mast, there can be low-intensity obstruction lights. The cones themselves are illuminated by spotlights. Taxiway lighting consists of edge lights (blue) and centerline lights (green). Besides, on a taxiway, there are also clearance bar lights (yellow and flashing) and stop bar lights (low-intensity, red lights). An apron, according to the ICAO regulations (International Civil Aviation Organization), does not belong to the movement area of an airport. 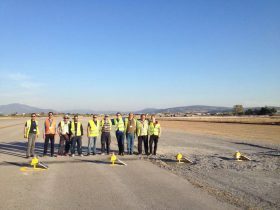 Therefore, it is more accessible for the users than a runway or taxiway. However, the people intending to use it must obtain a special permission. Aircraft parking, luggage loading and unloading, security check and fueling are the examples of operations that take place at an apron. Thus, this place must be properly illuminated as well. Bright, white lights are used for that, either conventional or solar. Sometimes, it is enough to illuminate aprons with the same blue lights as for taxiway. Initially, solar airport lighting systems were used as an emergency solution in case conventional lighting failure. However, these days the situation is different because of the development of the technologies that use solar energy to produce power. Solar airport lighting systems are used not only as a backup solution for conventional lighting. They are successfully working as a permanent lighting system or as an emergency airfield lighting system. The implementation of LED lightbulbs was a milestone. They provide a proper light intensity and chromaticity. Moreover, they are really durable – can work 50 000 hours and even more. Conventional airport lighting (AGL) is powered by an electric power grid. It means that the use of alternators, isolating transformers and hundreds of meters of wires is required. Certainly, such a lighting system is almost failure-free. However, if one unit stops working, it can affect the performance of many other elements. Contrary to AGL, airport solar lighting systems consist of elements (lamps) which work independently. The performance of particular units does not affect other units. Besides that, conventional lighting is dependent on electric current. Airport solar lighting, however, can be powered in three different ways: via solar panels, charging station or from an electric power grid.